Kanako is originally from the city of Toyota, Aichi Prefecture. Her childhood encounter with some children from abroad whose parents worked for Toyota Motor brought her curiosity about the world. After graduating from Ritsumeikan Asia Pacific University with a bachelor degree of Business Administration, she spent nine years in Tokyo as an international sales representative for a Japanese power equipment manufacturer. Through her business experience mainly in European and Australasian markets, she learned the importance of mutual understanding in global society. 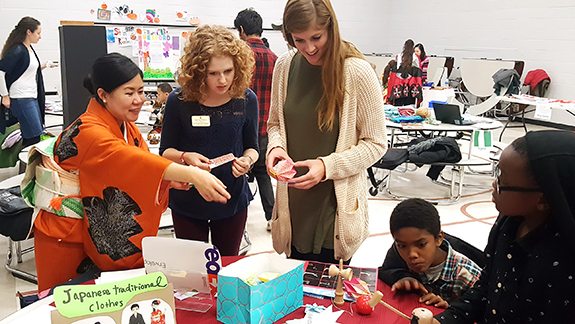 Kanako became a JOI Coordinator to take on the challenge of working in citizen diplomacy in the U.S, learning about international relations, and enhancing her skills abroad. During her two-year assignment, the state of Michigan and Shiga Prefecture will celebrate 50 years as sister states. In addition to enriching the sister state relationship, Kanako aims to provide opportunities to people in her area to learn about Japan and foster greater interest in the world.